So, three weeks on from a muted Russian Grand Prix (both on and off the track), Formula 1 rolled into the USA, traditionally not a country noted for its enthusiastic response to F1, but judging from the reaction of the fans, its popularity is certainly on the up! Not that Formula 1 didn’t arrive in Austin free from troubles. The Marussia and Caterham teams (both usually at the back of the grid) went into administration last week, and as a result, were absent from the race. Talk of different ways to share F1’s considerable wealth was rife, and there was the possibility of some teams staging a boycott of the race – which thankfully did not come to pass. The race itself was, as usual, dominated by the Mercedes cars of Rosberg and Hamilton – Rosberg had qualified in pole ahead of Hamilton, but the Englishman kept pace quite nicely with his teammate for the first half of the race. Down the order, Daniel Riccardo had a bad start but was soon carving his way up the pack, including a scintillating move on Ferrari’s Fernando Alonso. 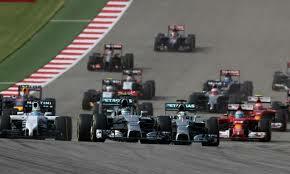 He then set about chasing the Williams’ cars, eventually leapfrogging Bottas at the first round of stops. Riccardo’s Red Bull teammate Sebastian Vettel had to start from the pit lane following an engine penalty, but, despite struggling with the car early on, and five pit stops, he defied a lot of his critics to push through the pack and end up seventh – though he was undoubtedly aided by the first-lap retirements of Perez and Sutil (who collided, thanks to Perez) and the retirement of Hulkenberg later on. Still, it was a good drive from Vettel. Up front, Hamilton maintained some steady pressure on Rosberg, lurking within a second of him until lap 24, when he left his braking into turn 12 very late, catching Rosberg by surprise and sneaking past him. Hamilton would go on to take his tenth win of the season and the 32nd win of his career – beating Nigel Mansell’s record of 31 wins and equaling Fernando Alonso on the all-time win stakes. He now has a 24-point lead in the championship, and can afford to finish second to Rosberg in the last two races – but he is unlikely to settle for second.